As a fireworks fan, you have no doubt shot a few Roman candles as part of your backyard shows. But as your love of fireworks grew, chances are you dropped Roman candles from your shows in favor of multi-shot repeaters. Let’s face it–when compared to a repeater’s “show in a box,” firing a single Roman candle is a little dull. But don’t count them out yet! 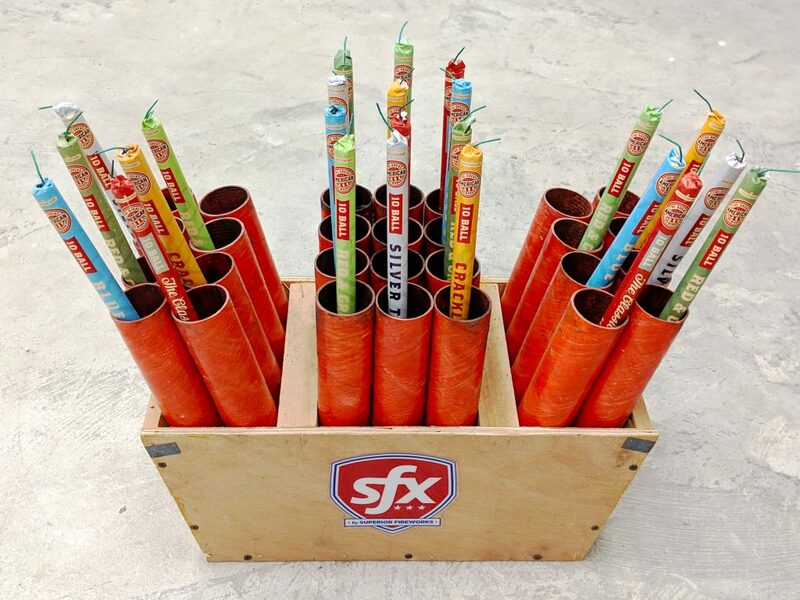 Firing multiple candles together in a Roman candle rack allows you to create unique and spectacular show elements that will WOW your audience. We are not going to sugar coat it for you. Building and fusing a Roman candle rack is a labor of love. Aside from building the rack itself, it takes time and patience to fuse the candles together properly. The short fuses on most candles make getting a good connection between the leader fuse and the candle fuse a challenge. But your efforts will be rewarded with an amazing display that can’t be bought from a store shelf. 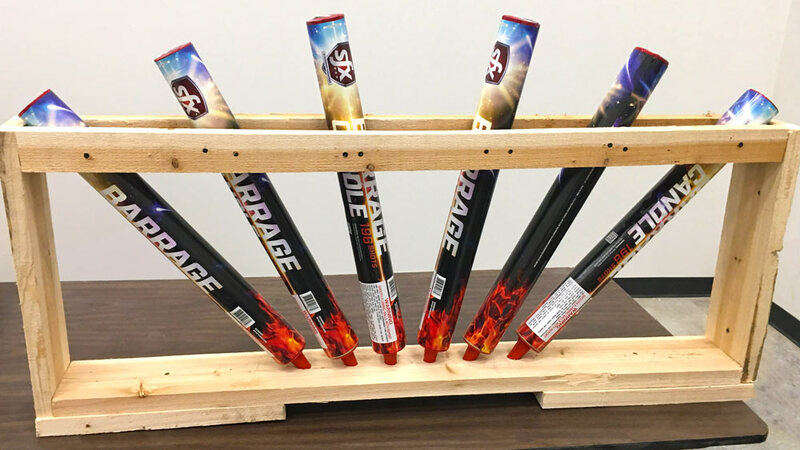 We have used several different Roman candle rack designs in our demos and shows over the years. Below are two designs you could use for most of the Roman candles we carry. We didn’t write up plans for how to build these but there are numerous how-tos on the internet if you need detailed help. And if you don’t feel like building your own Roman candle rack, you can use a mortar rack instead. We have used our 28-Shot Mortar Racks at some of our demos with great success. We recently tried a new Roman candle rack design using scrap lumber in the warehouse and 1-inch square wire mesh. This design proved to be extremely flexible in that we were able to have many different candle configurations without having to build a rack specific to each one. One issue we did run into was the 1-inch holes were a little small for larger candles like Full Bore, so you might consider a large size mesh or chicken wire to accommodate thicker candles. You may recall us using the SFX 196-Shot Barrage Candles as part of the finale in our recent Memorial Day show. We built two of the racks pictured below and used a full case of the barrage candles, six candles in each rack. Since the barrage candles are over 3” thick, the wire mesh design we used for Cosmic Tails and Full Bore was just not practical. Below is a clip of the candle racks in action. We are sure you will agree, all these candles and shots going off together is amazing! 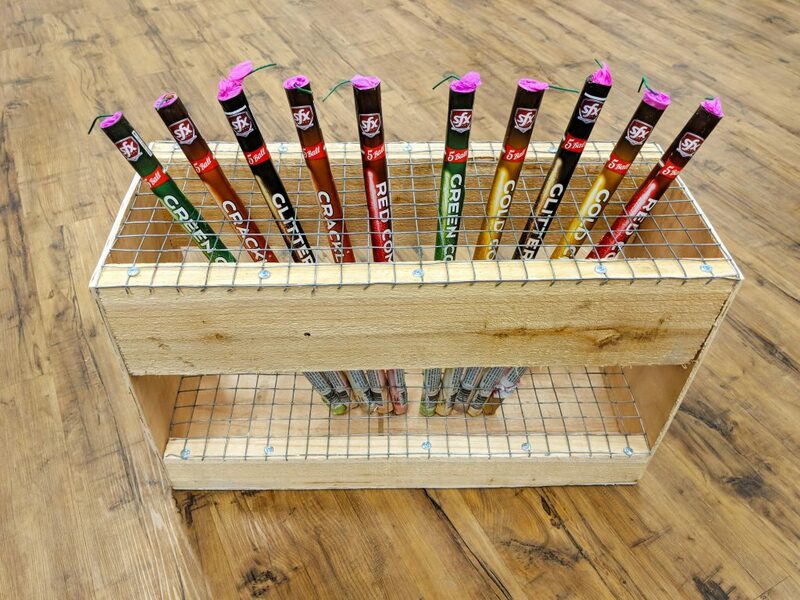 Take some time to experiment with your own Roman candle rack designs and explore all the different effect combinations you can create. Combined with our wide selection of Roman candles, you will have everything you need to essentially create your own custom repeater. Be sure to capture your creation on video and share it on social media using #MySuperiorFireworks. We always enjoy seeing your handiwork!